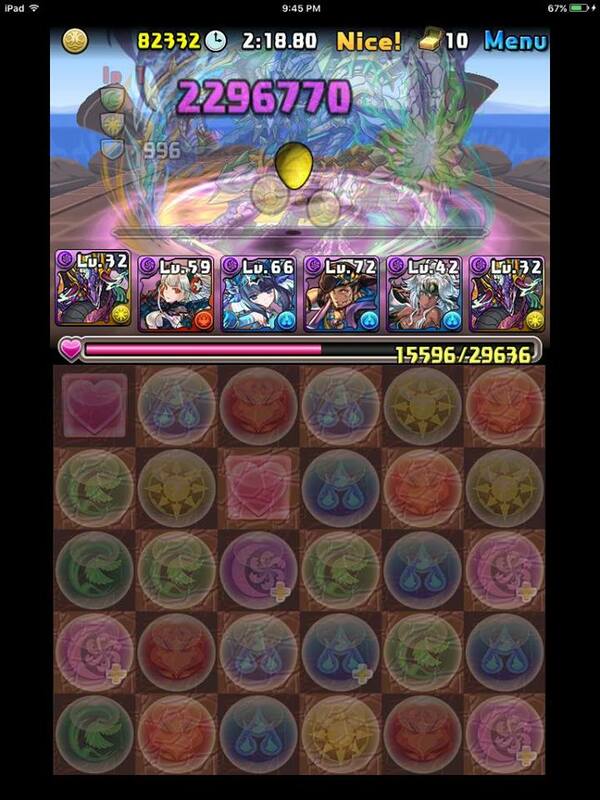 First of all, I love playing with myself; in coop, PAD multiplayer mode. 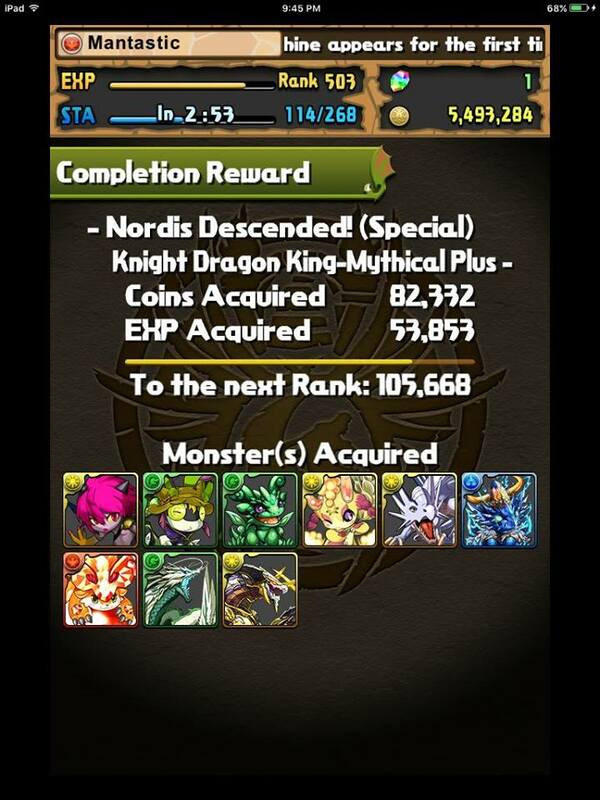 Now that I have that out of my system, I can properly explain my strategy for clearing Nordis Descended – Mythical Plus which is the found in the coop/multiplayer dungeon section. Mythical Plus differs from the regular Nordis Descended as the bosses have more health along with the nasty PreDRA spawn on floor 8. Thankfully, coop allows you to bring 8 subs to better combat the harder mechanics in Mythic Plus. 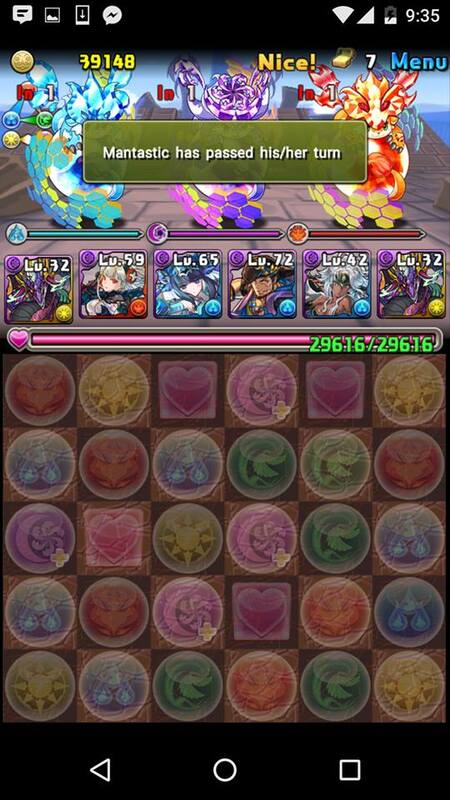 My 2 accounts (Mantastic and Fantastic) are able to do coop together by using their semi developed Yomi Dragon teams. When team building, I decided to load up Mantastic with more offensive / damage heavy subs and delegate Fantastic to utility / defensive abilities. This can have some advantages as you can coordinate your turns to have your offensive team face the more dangerous bosses while allowing the defensive team to absorb either the binds or handle the PreDra floor. Binds in multiplayer do not affect your partner’s team as only the leader is shared. Furthermore, any team used in Mythical Plus has to delegate one sub to countering the 3 PreDRAs who have 10 million defence, 50 HP, and hit for 24,000 every turn. As such, this sub is most likely “dead weight” for the remaining floors. 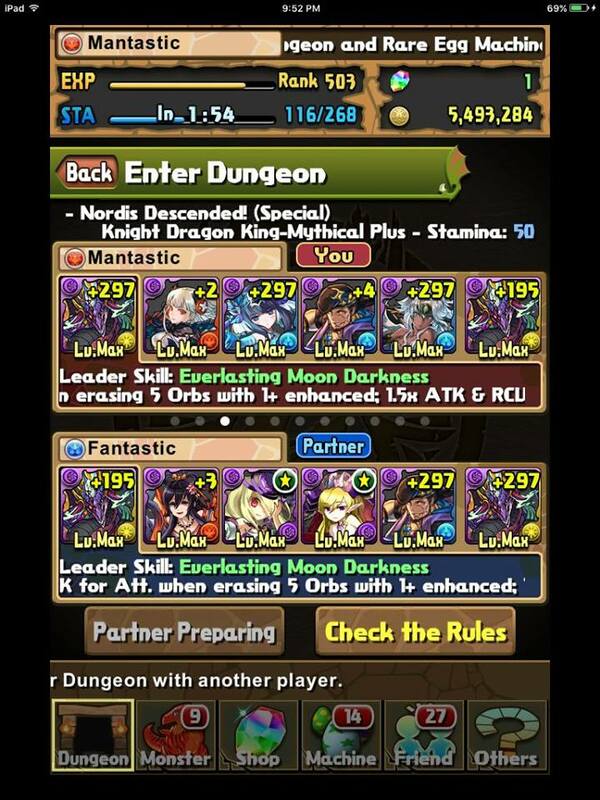 Nordis’s dungeon is favourable for dark teams as the majority of the floors are light and consequently you can deal double damage. Do note that the final floor does a 3 turn pre-emptive bind to all dark monsters; however, my leaders are bind immune and has the bind recover awakening. As mentioned above, binds that affect subs do not hinder your partner as they only play with their subs. Therefore I could plan my entrance into the boss floor and not be worried about binds. My logic for Mantastic was to use Claire ‘s heart to dark orb change in conjunction with to create a dark heavy board that can be matched to optimize two prong attacks due to , Awoken Haku , and Oku each having 2 awakenings. Furthermore, Dark Metatron can enhance all the newly spawned dark orbs along with utilizing ‘s 1.5x dark damage boost to nuke the 12+ million health of the final boss. Fantastic was delegated with bringing the counter to the PreDRAs through the farmable Lilith and shielding option of Dark Izanami . Pandora was chosen as another orb changer who happened to be max skilled and for his +297 status and to be used on the 9th floor versus Treedia who has 6 million health and starts in the green element. However, even the best laid plans can go awry and need to think quickly on your figurative feet to adapt. I miss judged my damage output on the 6th floor and that jumbled up my turn order (due to dealing too little damage with Fantastic partially because of low monster levels) and I had to pass my turn in order to safely bypass the PreDRA floor on the eighth floor. I also encountered another issue of the incorrect player making their turn during Nordis in his first form on floor 10. I was forced to sweep with Mantastic which threw out my plans for having Fantastic bound and subsequent active stack one-shot. Therefore I used ‘s shield to mitigate the incoming damage and killed once my binds were cleared. I am probably going to have to do coop with other people to tackle the other Mythic Plus descends or at least significantly power up both my teams before attempting others. However, farming Nordis on Mythic Plus is great to do as it offers massive rank experience, 500 Monster Points, and eventually a max skilled . Let me know your experience with coop and what teams you ran to clear the Mythic Plus content. I just found your site and it is clearly written. Ty for all your time!